Rhyd Y Benwch Car Park and Picnic Area (Grid Reference: SN 857869). Schools need to enter by Friday 9th June. Schools can bring more than one team if they wish. To enter please complete the spreadsheet and return to Bill by 9th June. Following another successful series of schools cluster events last Autumn, the winners of each of the cluster competitions went on to compete in the respective South and North Powys Championships, which were held in February 2017. Many thanks to Terry ably assisted by Bev and Al for planning and organising todays great event at Nash Woods. A big thankyou to David Pal for controlling, Bill Marlow on download, Fay on the near start, the scouts for providing a great catering service. And a huge thankyou to Di and the army of helpers from Wrekin who helped out in a myriad of ways from carparking, starts, registration, control collecting - really appreciated all your help. The western MWOCcies set off in rain and mist so the dry weather was particularly appreciated! Welcome to the Aber Uni team, and good to see many new faces - hope to see you at the Welsh Championships weekend 4th&5th March at Merthyr Mawr organised by Swansea Bay Orienteering Club and the South Wales Orienteering Club event at Cwm Lickey which is the first round of the Compass Sport cup on 12th Mar. Our next MWOC event is at Brynbras on 2nd April. 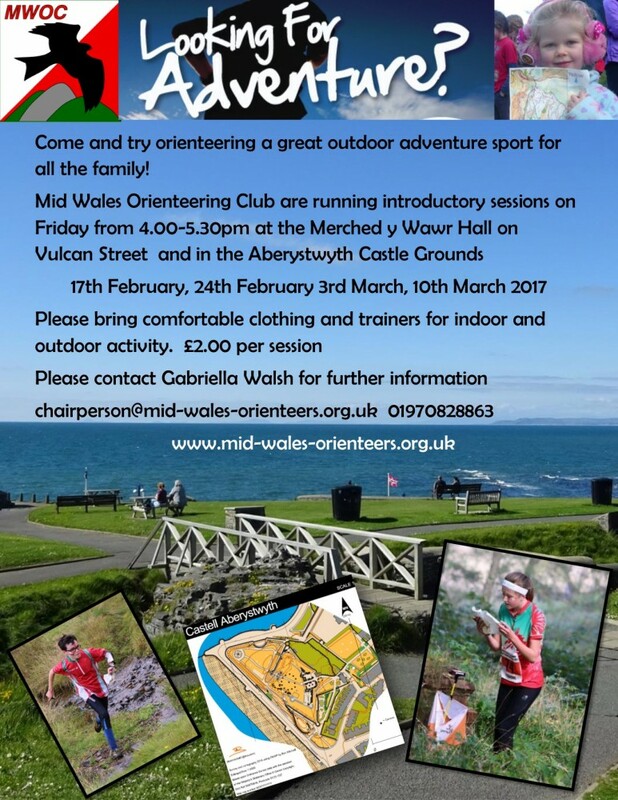 Come and try orienteering in Aberystwyth! Please bring comfortable clothing and trainers for indoor and outdoor activity. £2.00 per session. Please contact Gabriella Walsh for further information. 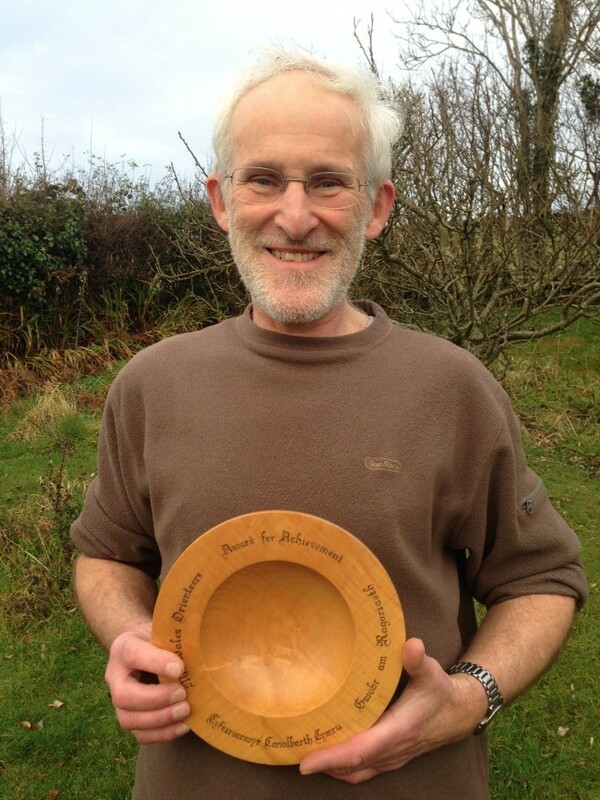 A brief history of Garri's life and tributes from fellow Orienteers. Well done to everyone who faced the Penglais challenge today with two orienteering courses to complete with the mini maze in the middle. A big welcome to all newcomers including our youngest event attendee yet Liv and Josh's 7 week old daughter. Thanks to the Maze maestros Steve and Ieuan for setting up and manning the maze, Zoe on download and results, Kate & Anne for cake making (Anne's fresh baked apple cake disappeared in record time...!) Pete, Mike, Kate and Zoe for collecting controls, and Catrin, Ieuan, Terry, Alistair, Zoe, Steve, Kate, Mike, Pete for striking camp! Thanks to everyone else who helped out in any way much appreciated - a record clear up time today. Results are up on the website now! Clive King had a great start to the year - thumbs up to British Orienteering for excellent customer service when he renewed his British Orienteering family membership - seamless and hassle free (in great contrast to his next phone call to a well known Utility company who were singularly unhelpful!) Entry fees for orienteering events now great value for the family - the lovely glossy British Orienteering magazine to look forward to and discounts at lots of major outdoor retail...ers and activities - Membership renewal is easy via the MWOC website or British Orienteering - £15 for adults and £5.30 for juniors. When you first join MWOC you will also receive a free copy of Carol McNeil's excellent book giving an introduction to orienteering techniques. Please contact Gabriella if you havent had yours yet! Congratulations to Rowen and Andrew King who are pictured here with their bronze and silver trophies from the MWOC 2016 League Orange course. Come along and enjoy the delights of Penglais Woods, Aberystwyth for our first orienteering event of 2017 and the start of the club league. Penglais woods are on the north edge of Aberystwyth with great views over the town and out to sea. They are a mixture of open areas with intricate detail from old quarrying and mature broadleaved woodland with a great maze of paths. The courses planned are great fun with one loop followed by a mini maze in the middle then turn over your map for the second loop all as part of your course!. The courses are a little shorter than usual with more controls. There are a range of courses from shorter and easier to longer and more challenging. Kick off 2017 with the Penglais Challenge for your mind and body! Congratulations to Mike Kay for receiving the MWOC Award for Achievement 2016 for all his hard work this year. Mike organised the MWOC day 4 at CROESO at Mynydd Llangynidr as part of the multi day orienteering event in SouthWales this year. Added organisational challenge was provided by the need for bussing to the arena and last minute track mat requirements. It was a great day of challenging orienteering with great feedback from competitors despite the weather conditions. Well done Mike and all those who helped with the day. Mike has also done a fantastic job as our Team Captain for the JK relay competitions organising the teams and the all important team names with great post race analysis. He organised another great day of orienteering at Foel Goch. Mike is also the Equipment officer for the club with a dedicated kit shed. Mike takes fantastic photographs and makes great publicity materials for the club too. A Big Thankyou to Mike ! Many thanks to Robert Griffiths for mapping this great new area for orienteering and to Justin Lyons from NRW for permission to use the area. Thanks to Robert for planning a great event and organising the Christmas meal after the event. Robert is seen here with his granddaughter Lleucu who completed her second course today! Many many thanks to all those who have helped make our orienteering events happen this year with planning, organising, download, control collecting, cake baking, tea making and all the behind the scenes activity! # Big Thankyou - we couldn't do it without you!